There’s nothing that frustrates us more than seeing a beautifully crafted email render properly on some screens, but not others. Over the past few months, the Mailjet team has been hard at work creating a new tool that makes responsive email design possible for anyone. 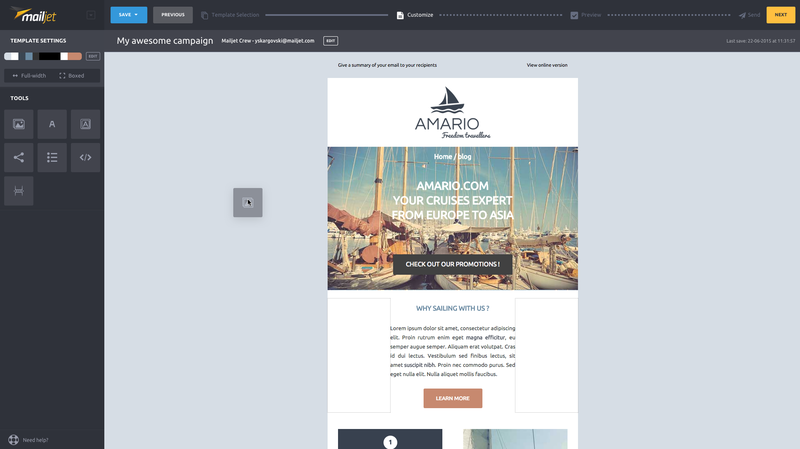 Introducing Passport, your tool to a bigger, better world of email design. Choose from Mailjet’s growing library of pre-made templates. Easily customize color palette and layout, add personalization blocks to address your customer by name, refer to a previous order and more. Create a branded email with a few clicks and no limitations. More advanced users can even inject custom-coded sections with an HTML block. Save even more time by saving your work as a custom template in your own library, to be re-used for future sends. Never second guess your code again. Passport’s HTML editor has a real-time preview that allows you to know what your code looks like before it lands in the inbox. Rest easy knowing that your content looks great across mobile, tablet, desktop and laptop. Get a sneak peek of how your email renders before you hit send. Hop on over here to check out Passport and try it out today.